Flawless phenotype, power and performance with an impressive maternal pedigree. 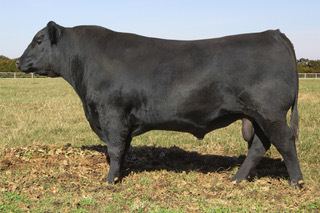 His VRD dam is a third generation pathfinder.His full sister, DLB Miss Aberdeen 225 is a fourth generation pathfinder.Six of the seven closest cows on the bottom side of his pedigree are pathfinders. His calves are coming light and have outstanding performance, wide tops and great hips. This bull is going to produce some long lasting females.